There has been some rumbling from folks using the different options they have found around an uncomfortable latency between the finger writing and the lines on the screen appearing. Usually, the lines are also off from where they where actually writing. It’s the little things that will drive a person crazy when they need it to just work. Being an Apple prod, apps have a pretty high standard to live up to. This isn’t a new problem, we have just had to live with it on tablets we have used in years past… and one of the major drivers for us to leave them on the shelves unused. No one is mentioning latency in their reviews so we will start reporting what we find. 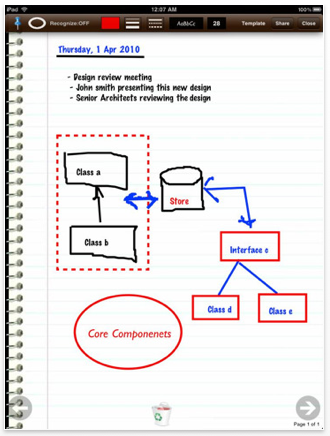 One app that is very popular amongst us ‘pen ink’ writers has been MyNotes. It starts with a screen of you different note stacks, which are actually multipage notebooks. Once on a page you can type, write and leave in ink or write in ink and have MyNotes straighten the lines which makes drawing lines, squares and circles look much better when your done. 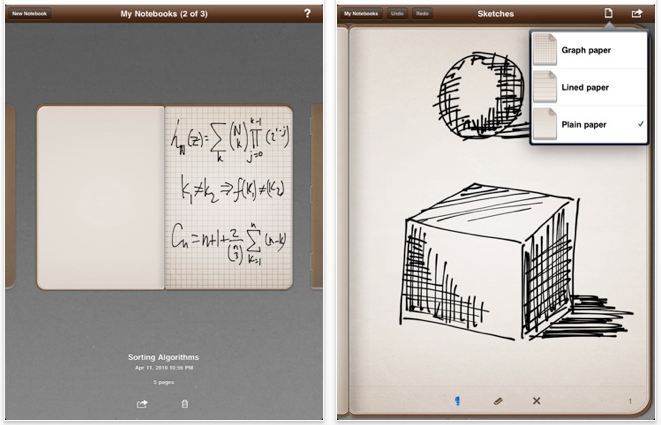 Being early to the ink notes options right after the iPad launch, MyNotes may get some tuning over the next months. For now though, the features are nice but it is a shining example of an app that misses the alignment of the ink to your finger and takes some time before the line appears. We like the pen thickness options and the mix of text options, hope the developer tunes a bit for more usability. A new option we just found is Penultimate. 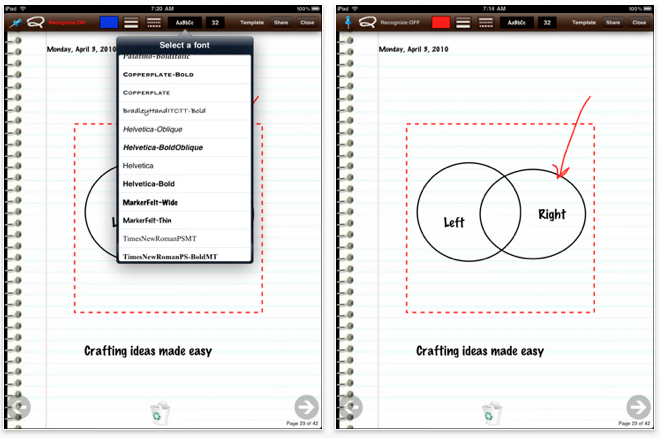 It also offers the ability to set up multiple notebooks. They have chosen to have your notebooks side by side that you sweep through the covers to find the one you want to edit pages in. 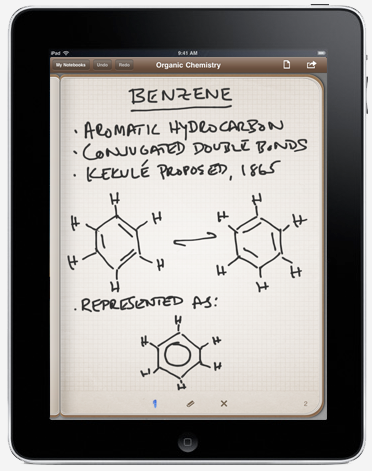 For folks that carried a moleskin prior to the iPad, they will love Penultimate. You have three paper types and very quick precise ink, no latency at all. Draw or write and turn the page for more. No keyboard text of pen adjustments, it is all about a pen and paper. You don’t have to rip a page out of your notebook though to share, there is an option to send a page as a PDF in an email. Looks like we will be moving Penultimate closer to the first launcher page on the iPad to use as the first option to jot on the go.